We are happy to confirm that thanks to an intense year of effort by ICOH, IOHA and other partners, our suggested language related to workers is successfully included in this endorsed Declaration. Click on the link above and see Paragraph 17, which identifies ”health care workers, miners and others exposed to silica” as high-risk vulnerable groups. Also see Paragraph 31, which says: “Commit to… implementing primary prevention in high-risk occupations by reducing silica dust exposures in mining, construction and other dusty workplaces, and worker tuberculosis surveillance and infection prevention and control in healthcare settings”. The rationale and some of the many efforts leading to this success are summarized at http://www.icohweb.org/site/news-detail.asp?id=152. We are also pleased to share that Dr. Sophie Kisting, lead developer of the ICOH Statement on “Preventing TB among Health Workers and Executive Director, National Institute for Occupational Health, South Africa, was a key presenter at the Africa Side Event held on September 25, prior to the UN TB Meeting. Her outstanding presentation was well-received. She addressed “Prevention of TB through inclusive workplace action”. 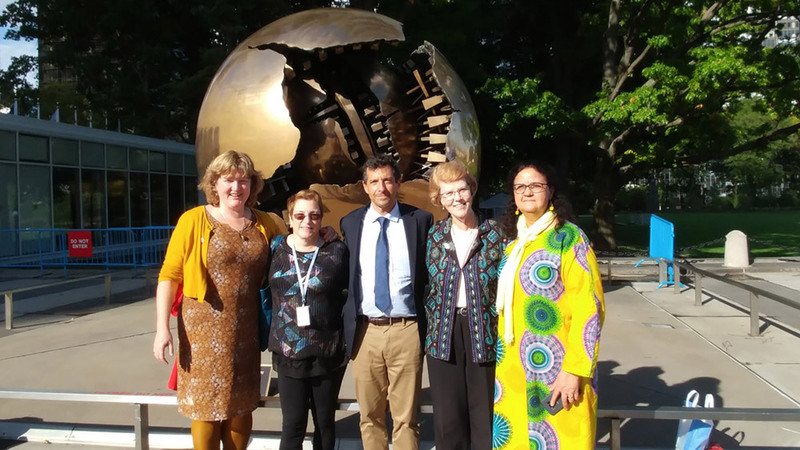 ICOH was represented at the UN TB Meeting by Gwen Brachman, Perry Gottesfeld, Marilyn Fingerhut, and Sophie Kisting. IOHA was represented by Andrea Hiddinga, immediate past President International Occupational Hygiene Association (left in picture). Next steps include development of workplans to facilitate assistance to countries and organizations to implement workplace practices to reduce silica in workplaces and to protect health workers. These efforts will take place via the ICOH TB-Silica Subcommittee of SC MinOSH and the TB-Health Worker Subcommittee of SC OH Health Workers. We will be reaching out to ICOH SCs and members, IOHA, and the (currently 65) organizations which endorsed the ICOH TB Statements. The Statements and endorsers are located at http://www.icohweb.org/site/ICOH-TB-Statements.asp.